The Kicker Hideaway is a great sounding, powerful compact speaker at pretty good price. I installed one under the front seat of my Ford F150. I have to say, it may be the best interior upgrade I have ever done to my truck. It is barely visible under my seat, the only part you can see is one edge of the box, which blends right in with my black seats. This is exactly what I was looking for, I’m not particularly fond of big ‘in your face’ sub-woofers. It was some decent low frequency bass I was after. I already had upgraded door speakers installed, but there was slight distortion with the bass turned up and driving on rough terrain. 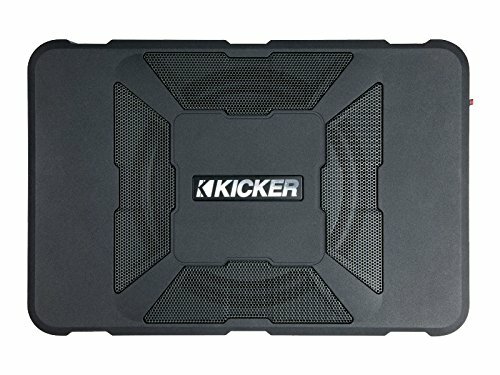 The kicker hideaway really allowed my to take my trucks audio to the next level, without breaking the bank! At the time of writing this review, the price was about 200 bucks, which is pretty cheap for a sub woofer of this high quality. You can Click Here to check the latest price on Amazon, although I can’t see the price dropping much anytime soon as they are selling like hot cakes! What are the technical specs of the Kicker Hideaway? So, as you can see, Kicker manages to squeeze some decent spec into the compact box. It also comes with all necessary wiring and fixtures needed to secure it to your Ford. You can view everything included in the package on Amazon. Don’t worry if you don’t have an aftermarket head unit, the Kicker connects easily to almost all factory and aftermarket head units. You will have no problem connecting it to the stock head unit a Ford F150. Its compact size – fits unoticeably right under my driver seat. I love the bass dial, my wife can easily turn down the bass when shes driving. Comes with all the necessary wires for installation. One thing I will say, if you are looking for a sub woofer that you will hear from 6 blocks away, then this isn’t the one your after. But if its good quality and a bit of boom your after, without costing an arm and a leg, then you will be more than happy with this. If you want to see the Kicker sub in action, check out the video below. Feel free to leave a comment and tell me what you think. Have a look at our Interior, Exterior and Performance sections to find more awesome upgrades for your truck! What type do you suggest for the budget of $500? Thanks. These are the best and most needed products for trucks and cars.